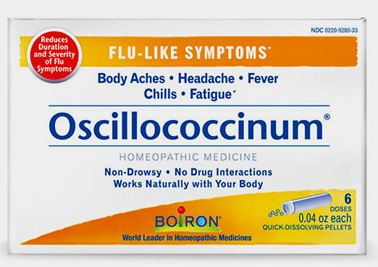 Oscillococcinum, 6 Doses - 0.04 oz each (Boiron) - Penn Herb Co. Ltd.
Flu-Like Symptoms? Feel Better Fast With Oscillo! Take Oscillococcinum® at the first sign of flu-like symptoms. It has been shown in clinical studies to help reduce both the duration and severity of symptoms such as body aches, headache, fever, chills, and fatigue. Ideal for people on the go, Oscillococcinum dissolves quickly under the tongue and does not require water. ACTIVE INGREDIENTS: Anas barbarice hepatis et cordis extractum HPUS 200CK HPUS. INACTIVE INGREDIENTS: Sucrose, Lactose. Contains 1g of sugar per dose. DIABETICS: THIS PRODUCT CONTAINS SUGAR. The letters HPUS indicate that this ingredient is officially included in the Homeopathic Pharmacopeia of the United States. Temporarily relieves flu-like symptoms such as feeling run down, headache, body aches, chills and fever. ADULTS & CHILDREN 2 YEARS AND OVER: Dissolve entire contents of one tube in the mouth every 6 hours, up to 3 times a day. CHILDREN UNDER 2 YEARS: Ask a doctor. IF PREGNANT OR BREAST-FEEDING, ASK A HEALTH PROFESSIONAL BEFORE USE.